Congratulations to our school-aged Room 27 kids for organizing such a successful bake sale. 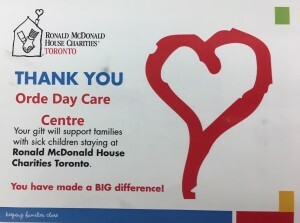 The results of your hard work resulted in a $444.80 donation made on your behalf to the Ronald McDonald House. Our school age March Break program is now open for registration. Please contact Gary Duncan at 416 598 3412 or admin@ordedaycare.org to sign up for our exciting March Break! Tax receipts are available for pick up at the location your child currently attends or previously attended. Please go to the daycare office for your receipt. From September 6-8, 2016 we will be temporarily using Boaden Catering to provide lunch to our preschool and school age children. On September 9, 2016 we will be having a pizza lunch, provided by Pizza Pizza . Morning and afternoon snacks for all our programs will be prepared by the daycare. If you have any questions, please let us know.